This hike begins just north of Great Falls Basin at the mouth of Rattlesnake Canyon on the east side of the Argus Range in Searles Valley. It involves following dirt roads, a narrow trail used by motorcyclists, some off-trail hiking down a wash, and some more dirt road. There are several opportunities to vary the route slightly with a number of interesting sites which can be visited to extend the mileage slightly. It is worth mentioning that turning left on either P25 or P29 will take you to P26, which will get you to P24. However, the most direct route to the trailhead bypasses these roads. It's also possible to continue on P27 and get to P26, but that route is even less direct than the routes involving P25 or P29. HIKE DIRECTIONS: From the trailhead hike west to the end of P24 (approximately a half mile). From there find the trail heading to the north up Rattlesnake Canyon. This trail is usually easy to find since there are likely to be motorcycle tire tracks on this route. Follow the trail to the Mohawk Mine. 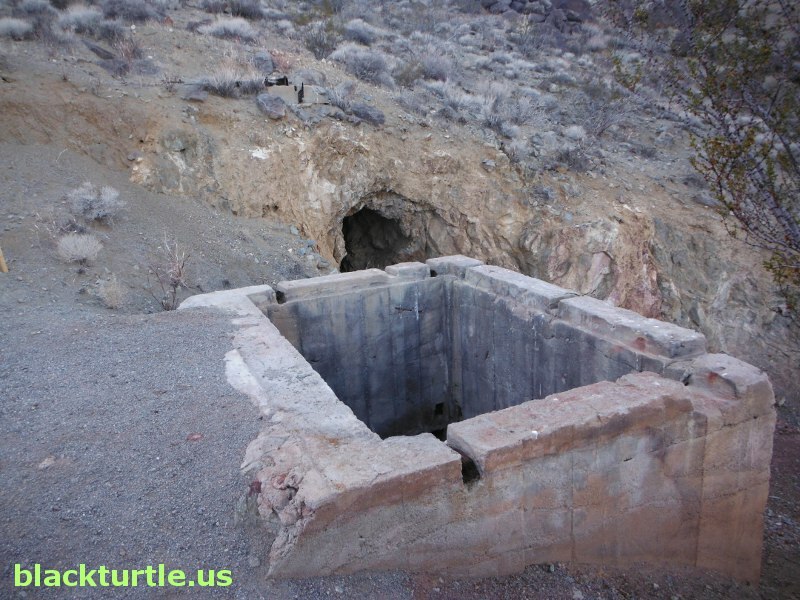 (The tunnel here is actually the west entrance to the mine.) Follow the road heading east from the Mohawk Mine. At approximately 1.6 miles into the hike an unmarked intersection is reached. Stay right (east) and hike by the east entrance of the Mohawk Mine. A little ways below the mine P19 begins. Follow P19 for about a quarter of a mile and turn right (east) and follow this unmarked road to where it ends at the top of a wash. Follow the wash (see note) for over a mile and eventually you get to P26. Turn right (south) on P26 and follow it to P24 and then follow P24 for about eight-tenths of a mile back to the trailhead. NOTE: This section of the hike is off-trail. There are a few minor obstacles that must be negotiated. Only one is likely to require the use of the hands. That being said, anyone who does not feel comfortable dealing with small obstacles should not take this route. 1. Spur Road South: Just before reaching the wash at about three miles, you will pass by a road that takes off to the south. Following this road adds about a miles (half mile each way) to the loop. 2. Homewood View: Instead of turning east at 1.75, turn west and head up to top of ridge for view of the Crow Canyon portion of Homewood Canyon. Loop north a short distance and then turn east to resume loop. This adds about a half mile to full loop. 3. Peak 3523': After turning east from P19 veer north and follow faint road which heads up to high point to the north. The road to the top of this peak is a little over a mile each way. 4. Veto Mine: Take road leading to Peak 3523', but continue through gap and down wash. Veer north towards Veto Mine. Once done exploring cabin and items at this site, follow road east and then south back to trailhead. This adds about 1.2 miles to full loop.